Defense Secretary James Mattis speaks about the National Defense Review, Jan. 19, 2018, in Washington. Turkey is sending the United States “conflicting signals” about its operation against Kurdish forces in northwestern Syria, raising concerns in Washington that the offensive could backfire and empower either the Islamic State terror group, Syrian President Bashar al-Assad, or both. Senior U.S. administration officials said Tuesday that Ankara has so far failed to provide any clarity on what it hopes to achieve, despite daily conversations between high-ranking officials in both countries. “We're going to have to see how this develops on the ground,” the official added. 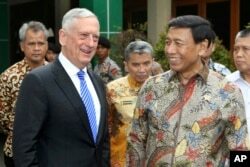 U.S. Defense Secretary Jim Mattis, left, smiles with Indonesian Coordinating Minister for Politics, Security and Law Wiranto after a meeting in Jakarta, Indonesia, Jan. 23, 2018. The comments from Washington come after U.S. Defense Secretary Jim Mattis issued a strong rebuke of Turkey’s actions during a visit to Indonesia. “The violence in Afrin disrupts what was a relatively stable area of Syria. It distracts from international efforts to ensure the defeat of ISIS, and this could be exploited by ISIS and al-Qaida,” Mattis told reporters. Turkey last week began bombing the Kurdish-controlled region of Afrin along the Turkish border in an attempt to drive out the Kurdish People's Protection Units, or YPG. A United Nations report Tuesday estimated about 5,000 people have been displaced so far as a result of the offensive, which Turkey is calling “Operation Olive Branch,” with some of the most vulnerable people unable to flee. Turkey says it has been taking measures to prevent civilian casualties and that the Afrin operation had killed at least 260 YPG and IS fighters. But U.S. officials say there are no IS fighters in the region and have repeatedly urged Turkey to exercise restraint. 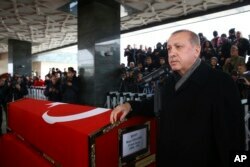 Turkey's President Recep Tayyip Erdogan speaks during the funeral prayers for Sergeant Musa Ozalkan, the first Turkish soldier to be killed in Turkey's cross-border Operation Olive Branch in northern Syria, in Ankara, Turkey, Jan. 23, 2018. President Donald Trump is expected to speak with Turkish President Recep Tayyip Erdogan on Wednesday, and officials say Trump will personally urge the Turkish leader to de-escalate. The YPG has been a key U.S. partner in the war against IS and makes up a large portion of the Syrian Democratic Forces — a coalition that has forced IS militants from virtually their entire so-called caliphate. Senior U.S. officials Tuesday drew a distinction between YPG fighters who have worked with anti-IS coalition forces in eastern parts of Syria and the YPG in Afrin, saying those in Afrin have never worked with the U.S.
Turkish Army soldiers form a convoy of armoured personnel carriers near the border with Syria, in the outskirts of Hassa, Turkey, Jan. 23, 2018. At the same time, U.S. officials say they are doing what they can to make sure the situation in Afrin does not get out of control, using intermediaries to warn YPG fighters that have worked with coalition forces not to head to Afrin, or risk losing U.S. support. Another official cautioned the U.S. was also relying less on YPG forces to fight IS in Syria, saying the YPG was no longer considered the backbone of the coalition-backed Syrian Democratic Forces (SDF). Turkey views the YPG as a terrorist group and accuses it of having links to Kurdish separatists. Turkish officials have said the offensive will not end until the YPG is forced from not only Afrin but also from the town of Manbij to the east.